Looking to give your skin a glow that lasts? 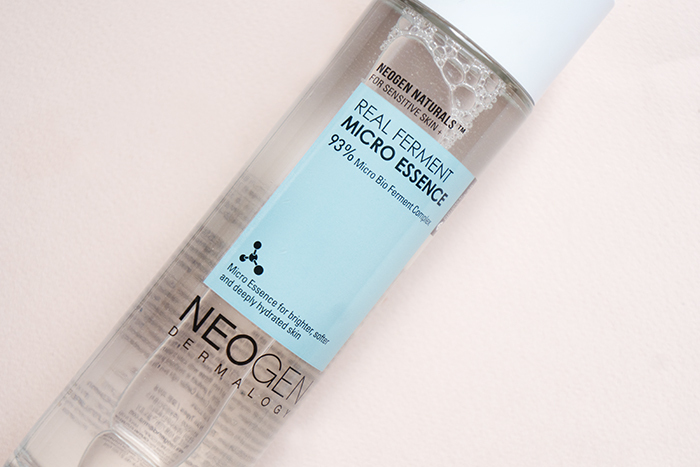 Read why the Neogen Real Ferment Micro Essence will end your search. Neogen has been one of my favorite brands since I stumbled upon its gauze exfoliating pads in Olive Young three years ago. Since then, the company has been turning out pretty impressive innovations, like the Capsule Sheet Masks and the Green Tea Foaming Cleanser. I also got the pleasure of co-creating the Green Tea Cleansing Stick which won the Teen Vogue Acne Award this year. So when the team at Neogen told me about their plans to create the Neogen Real Ferment Micro Essence a year ago, I was beyond excited because they consistently make such innovative, skin care gems. Now that the product is finalized and has arrived stateside, I can’t wait to share the details with you here. Why should you use an essence? First things first: What are essences? They’re not toners, contrary to popular belief. Essences are a very popular skin care category in Korea that is the heart of the K-beauty routine. 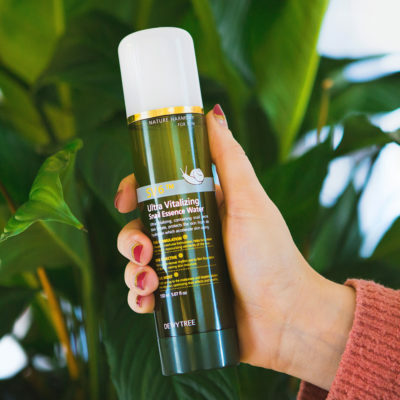 Korean essences are usually lightweight and watery, but they contain a highly concentrated formula that specifically targets wrinkles, fine lines, and dull and uneven skin tone. Essences are meant to absorb quickly, and their skin-benefitting ingredients are focused on hydration and brightening. This treatment product is such a big part of the Korean skin care routine, it seems like there isn’t a woman in Korea who doesn’t have an essence sitting on her vanity! 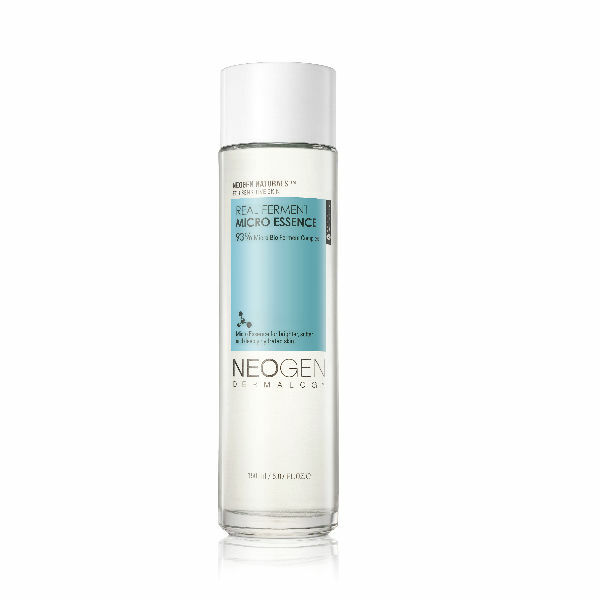 The Neogen Real Ferment Micro Essence was formulated to deeply hydrate skin, and there are some brightening effects as well! It reminds me of the Missha First Treatment Essence because the majority of their formula is fermented, except this one is 93% fermented, and to top if off, it contains some really stellar ingredients you’re going to love. There are so many skin-friendly ingredients in this essence, but I’m going to just dive deep in the top five. They appear in this order. Rice Ferment Filtrate: This has 9% rice extract in the formula, and is an antioxidant that brightens and hydrates skin. None. Nada. Zip. This was very surprising to me, considering many Neogen products contain fragrance. I’m glad they made this choice because I am a huge fan of fragrance-less skin care products, especially when it comes to my essences. So let’s get to the big “fermentation” question: Why should you know about fermented ingredients? Fermentation a complicated process that been used in more and more Korean beauty products. I’m not a super expert in fermentation, but I was lucky enough to speak with the Outin Futures R&D Director, G. Choo about it. He explained to me that it’s a huge deal when ingredients are fermented because they are put under a condition where light is virtually non-existent. They are also placed under a very particular temperature of 30-70 degrees celsius, with a humidity of 70-80%. It’s a very delicate balance determining how long these ingredients should be in this state because continued fermentation can actually cause the decomposition of ingredients. Just like with my other essences, after cleansing and toning, I sprinkle a few drops of this Neogen essence into the palm of my hand and tap it into my skin. I love how it feels on my skin so much, that after a minute or two I’ll add another layer of it on before moving onto my serum and eye cream steps. If you have oily skin or if you’re a fan of layering products, the consistency of this is perfect for you. Neogen gave me a bottle months ago and I’ve been using it religiously and it has become my go-to essence since then. It’ll most likely continue to be my essence throughout the colder months, and once it gets warmer, I’ll revert back to the Missha essence for the summer. The Neogen Real Ferment Micro Essence is a legit essence. If you’re someone with normal, combination to dry skin, or sensitive skin, I highly recommend using this essence morning and night for a few weeks and see how bouncy and elastic your skin feels. I credit this product as giving me the “honey skin” effect that everyone has been asking me about! + What’s your favorite essence for the winter? I’d love to read your picks in the comments!